The resignation of Jay Walder, has been stirring up discussion about the timely completion of MTA projects under way, including the Second Avenue Subway, 7 Line Extension and the East Side Access. The East Side Access project has garnered less attention than the other two, even though its impact will be as important. Like many MTA projects, this one has begun quite a long time ago, in 1969. A tunnel under the East River was built linking Manhattan to Queens. The MTA contractor floated four-chamber tunnel boxes into place in the East River and sank them to create the East River crossings for the subway and the LIRR. 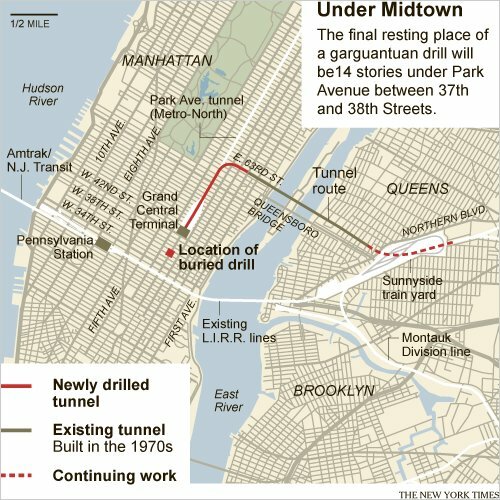 Construction was halted as a result of New York’s economic collapse in the early 1970s, but resumed later in the decade, expanding the tunnel into Queens. The current phase of the project will connect “the Long Island Rail Road’s (LIRR) Main and Port Washington lines in Queens to a new LIRR terminal beneath Grand Central Terminal in Manhattan”. The tunnel boring machine (TBM) that began its journey in 2007 on 63rd Street, reached its destination at Grand Central recently. While a lot of work still needs to be completed in Queens, the new LIRR concourse is beginning to taking shape under Grand Central. According to an MTA press release, the concourse will provide LIRR commuters with 91,000 square feet of public space, including shops and pathways to Grand Central Terminal, the subway system and the street above. The project is set to be completed in September 2016. Here is a photo tour of the process. An interesting tidbit about this project – which is bound to enter NYC lore like sewer alligators, the original City Hall station and the South 4th Station – is the ceremonial burial of one of the TBMs. The 200-ton machine will be left 14-stories below Park Avenue. According to the New York Times, the TBM “will be sealed off by a concrete wall; the chamber will then be filled with concrete, encasing the cutter in a solid cast, Han Solo-style, so that it can serve as a support structure for the tunnel.” The ceremony accompanying the pouring of the concrete is expected to take place on Wednesday. 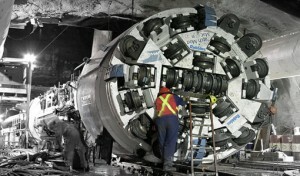 It is cheaper to leave the 6-8 million dollar machine underground than to pull it out. In New York, TBMs are generally excavated and sold for scrap. While it is generally a money-losing process, the New York underground is extremely crowded: buried wires, sewage pipes, pneumonic tubes, current and future subway tunnels take up a lot of space. Park Avenue and 37th Street, the final resting places for one of the East side TBM, is a unique spot because it does not interfere with any major infrastructure project, yet. Once the commemorative plaque on Park Avenue disappears, the TBM will inevitably be forgotten and re-discovered by engineers, planners or subterranean explorers sometime in the future.